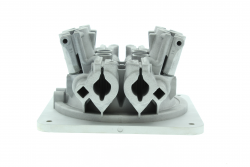 Durability & Integrity of Additive Manufactured Products: Do you really know what you’ve made? Additive Manufacture has advanced considerably since it was called Rapid Prototyping and the change of name reflects a different purpose. AM is no longer simply making a prototype, it is making a product fit for purpose. The benefits of AM are widely debated but the challenges of a new manufacturing process need to be addressed. Powder materials need to be stored, transported and reused, potentially degrading their performance. Products made by traditional manufacturing methods have known defects and AM can introduce its own flaws. These can be characterised by appropriate Non-Destructive Testing. The fatigue performance of any component is dependent upon the manufacturing route. AM opens up new opportunities in near net shape and low cost manufacturing provided the resulting structural integrity and durability are properly understood.